The highlight of the year for any cricket book lover is surely the release of the distinctive coloured Cricketers' bible, Wisden, and this year's edition is again full of the year's cricketing action. For the first time, there are only four cricketers of the year after the allegations against the fifth made his selection unsustainable in the opinion of the editor, Scyld Berry. For the first time also, a Bangladeshi, Tamim Iqbal, is recognised amongst the great names of the game and those who witnessed his glorious batting at Lord's and obvious joy at being mentioned on the Lord's honour boards should not be surprised. Sachin Tendulkar has been nominated as the leading Cricketer of the World for 2010 thus ensuring that an Indian retains the honour for the third successive year after Virender Sehwag's awards in 2009 and 2010. This is the seventh year of the award but notional winners have been backdated to 1900 and, unlike the Cricketer of the Year awards, players can win this coveted award more than once. Needless to say, readers are likely to find just about every piece of information within these hallowed pages and there is much, more also. If anyone wants to know how a twelfth man won a man of the match award, page 639 provides the answer and page 706 shows that road rage can affect cricket matches. Chief statistician, Philip Bailey, has done his usual admirable work in the presentation of the many statistical pieces and the entire format and layout of the Almanack is, as always, beautifully presented. The standard of the colour photographs and also the black and white ones are exemplary and Alastair Cook is, after his Ashes exploits, a fitting player to adorn the front cover. As always, there are very erudite articles written by some of the cricketing fraternity's leading writers and these include, amongst others, the Wisden Test XI to the shortest version of the game in the IPL and Lalit Modi. 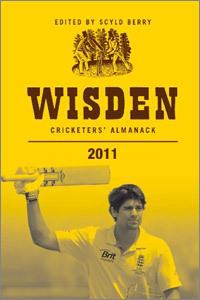 With the wealth of information ranging from international cricket through Schools cricket to village cricket, Wisden 2011 remains the book for all cricket fans and lovers.